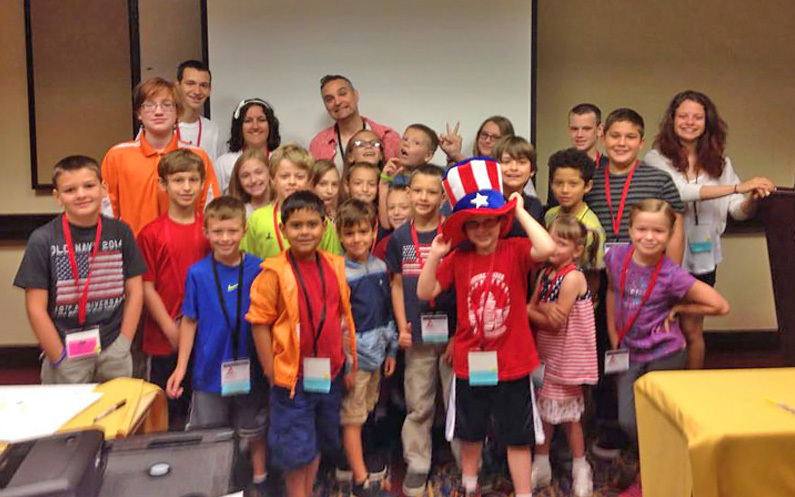 I just came back from attending the National Stuttering Association (NSA) conference for the fifth year in a row. As usual, it didn’t disappoint. This year, it took place in beautiful Washington, DC. Along with seeing the sights, meeting new friends and catching up with old ones, the highlight for me within my peripheral experience this year was an overall theme of mentorship, serving others and lifting up kids. 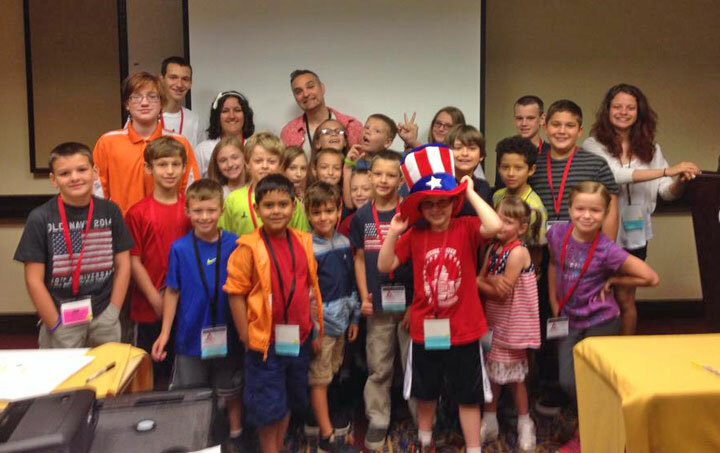 Twelve year old, Nate Rogers, who is a buddy of mine, is the youngest person to present a workshop at the NSA conference. This year, he answered questions about stuttering for parents in a workshop entitled “Everything You Ever Wanted to Ask a Kid Who Stutters” which was also the first time he presented on his own. A shining example of confidence and mentorship, many kids at the conference look up to Nate. He was also awarded Kid of the Year at the conference for his awareness and fundraising efforts along with his mother Melanie who was awarded Parent of the Year. In my opinion, speech therapy and speech tools make up only one piece of the dealing-with-stuttering puzzle. The other pieces involve the attitude one has towards their stuttering and hanging out with others who stutter. A lot of shame is experienced by those of us who stutter and for some, developing a thick skin and not letting stuttering get in the way of their lives can be a difficult concept to comprehend. This is where mentorship plays a key role. After all, you are the company that you keep. Hang out with confident people, and it’ll rub off on you. You’ll learn from them. See what they do, give it a try yourself, learn from your experiences. One small step at a time. Another buddy of mine gave a workshop to kids of ages ranging from 5 to around 12 years old. A couple of decades older than Nate, Jody Fuller is a comedian, speaker, author of three stories published in the Chicken Soup for the Soul series (this, this and this), and a major in the US Army. I sat in on Jody’s workshop which centered around connecting with people by sharing personal stories. Especially with humour as people are more likely to listen and remember. Jody shared his personal story with the kids on how he dealt with his stuttering by using humour and accepting his uniqueness back in the eighth grade. Later in the workshop, Jody gave the kids a chance to share their personal stories to the group by standing at the front of the room. It was touching to see each kid get up one by one and grow a little more confident in public speaking as they voluntarily went back up multiple times! Some of the kids told their stories in a low, shy voice but only to return with louder voices each time. This is all kids need regardless of speech fluency. A little reassurance, some mentorship, a bit of guidance and a chance to give things a try at their own pace. Come to think of it, adults need this, too. Jody started his workshop with our favorite pastime of going around the room introducing ourselves. I was moved as one kid encouraged his brother not to give up saying his name as he had trouble saying it. “You can do it”, he whispered to his brother with a smile. It took a while but he persisted and got it out. I noticed a familiar look of relief and accomplishment on his face as his chest puffed out with pride. Everyone in the room also gave him an enthusiastic round of applause. I ventured out of my comfort zone by accepting the invitation by Melanie to lead a workshop teaching kids how to draw comics about stuttering. I never taught before, let alone to kids, so this was definitely a first for me. I’m glad I took Melanie up on the offer as I enjoyed giving the workshop very much but most of all seeing the awesome results of children’s artworks. A few wrote alternate endings to a Franky Banky comic I showed them, some created and incorporated their own characters while others ventured away from the comic format and experimented with their own forms of art! There were many intriguing stories involving ninjas, service dogs, self-aware pens and bathroom humour (I take full responsibility for showing the Franky Banky comic involving flatulence). I don’t know how often these kids draw, but I felt all warm and fuzzy inside knowing that for at least about 90 minutes, they were given a chance to try a form of creative expression that might have been a first for them. Having a creative outlet — be it artistic, musical, writing, telling jokes or whatever floats your boat — is very therapeutic. You are able to express yourself, work out your thoughts, feel a sense of accomplishment, learn and grow from making mistakes, and connect with others around you in a unique way. You’re sharing a bit of your soul. Success in life is a choice. Make it happen! and we received a personal video message from Vice President Joe Biden who shared his personal stuttering stories and encouraged us not to let anyone tell us we can’t accomplish anything because of our speech. The NSA runs a store during the conference to raise funds. My book was among the items for sale and to my surprise, it had sold out by the end of the conference! My intention is not to brag but to share with you an epiphany that I had that was prompted by this. Just from within my own conference experience, the workshops Nate, Jody and I lead (and all the over 100 workshops that went on! ), the keynote speeches, the mentorship content in my book and the other books on sale — we all benefit from asking questions to learn from each other’s experiences and mentoring others to become the best we can be. I’m beginning to realize that the best thing about any stuttering conference is the ability to mentor our fellow stutterer. After all it’s hard to live with stuttering all by ourselves and we always feel great when we help someone. One more thing I wanted to talk about were the numerous monuments surrounding the National Mall which also played a big role in the theme of mentorship and service to others that I kept running into. I highly recommend seeing the monuments at night as the lighting gives them a more reverent and majestic atmosphere. They commemorate important figures in American history and very important events such as both world wars, the Vietnam War and the Korean War. There are many quotes around the monuments offering encouragement in tough, tough times such as a world war. They reminded me just how much we take freedom for granted and how impatient I tend to be expecting change to happen instantly. Among the thousands of names listed on the Vietnam Memorial to the thousands of gravestones at Arlington Cemetary dating back to the War of Independence on the other side of the city, to the words of encouragement by Dr. Martin Luther King, Jr., people have fought adversity with many paying the ultimate sacrifice. They don’t compare to going into battle by any stretch of the imagination, however, I was really inspired by these brave people from history to have courage in the personal challenges that I face. Many stutterers blame all their troubles on their speech yet the reality is, you can overcome the challenges it brings you. Just as long as you take matters into your own hands and make things happen. You have to build up your courage and face the social challenges, get beaten and try again. It’s the only way you and I will grow. It isn’t easy and yet it isn’t very difficult to do. All it takes are baby steps over time. And you have to keep in mind that change won’t be as instantaneous as you want it to. Just be sure you have friends who support you. Even better if they stutter as well. We benefit from our mentors. And when you reach that point where you’ve become a new person, don’t forget to reach out and mentor others who stutter. 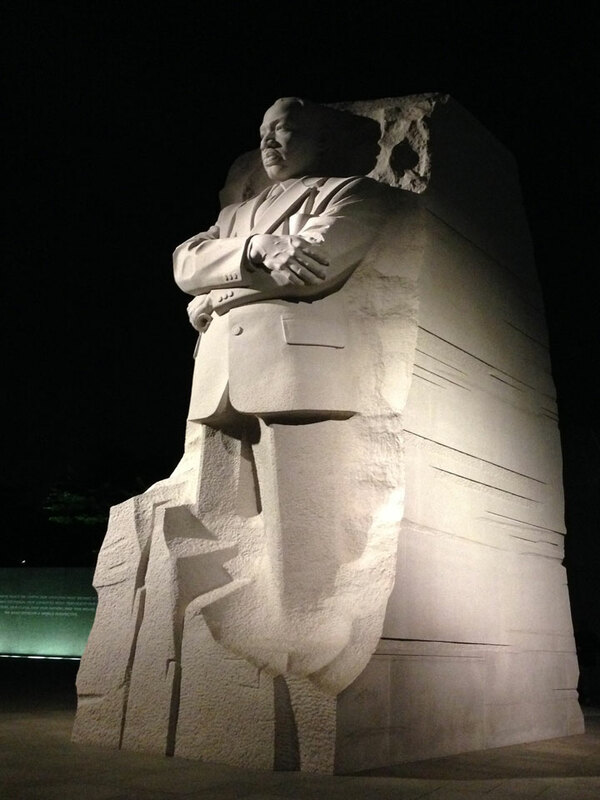 The majestic statue of Dr. Martin Luther King, Jr. in Washington, DC. Nearby is a fantastic quote by him which says “The ultimate measure of a man is not where he stands in moments of comfort and convenience, but where he stands at times of challenge and controversy.”. I’ve raved on and on over the years about the sheer awesomeness of the NSA conference and mention it many times in my book. But this year, during the final moments of the conference and on my flight home, I couldn’t help reflect on how much of a better man I had become from learning from the friends I’ve made and how they deal with their stuttering in everyday situations. They are regular people just like you and me. Some are in leadership roles, others are getting there. Previous Post Is stuttering cool? HECK YEAH!